ww2dbaseOn 26 Feb 1943, the new "Upkeep" bomb was approved for use against German dams. Designed by Barnes Wallis, "Upkeep" was a drum-shaped aerial bomb capable of spinning at the rate of 500 revolutions per second backwards, thus able to skip across water surfaces for some distance when released at a low altitude. When then make contact with the walls of dams, they would roll toward the base of the dam before their hydrostatic fuses detonated the explosives. ww2dbaseThe "dambusting" mission was given to Squadron X of the No. 5 Group of the British Royal Air Force, led by Wing Commander Guy Gibson, targeting Möhne, Sorpe, and Eder dams in the Ruhr River region of Germany. The aircraft Gibson's men flew were Lancaster Mk III bombers, with modified bomb bays, added special altimeters, and lightened by the removal of some armor plating. The attack, code named Operation Chastise, was organized into three groups. Formation 1 was to attack Möhne Dam, and if there were unused bombs, the formation was to perform an attack on Eder Dam. Formation 2 was to attack Sorpe Dam. Formation 3 was a mobile reserve group that would take off two hours after the first two groups departed, and remain in the air to receive further instructions, possibly making a second run on one of the three primary targets that Formation 1 or 2 might fail to destroy, or this third group might be ordered to attack the smaller dams at Schwelm, Ennepe and Diemel. The "Upkeep" bombs were delivered to the squadron on 13 May 1943, and the operation was launched at 2110 on 16 May. The first group of bombers took off at 2139 hours on 16 May, and the final (reserve) group took off at 0009 hours on 17 May. ww2dbaseThe nine bombers of Formation 1 entered continental Europe between Walcheren and Schouwen in the Netherlands, then skirted many major German defense concentrations before heading south toward Möhne Dam. Flight Lieutenant Astell's bomber was lost near Roosendaal in southern Netherlands after clipping power lines as a result of flying too low. ww2dbaseThe five bombers of Formation 2 entered continental Europe near Vlieland in northern Netherlands. They suffered early setbacks. Lieutenant Les Munro's aircraft was damaged by flak soon after entering the Netherlands and was forced to turn back, and Pilot Officer Rice returned after losing his bouncing bomb. The bomber flown by Pilot Officer Byers was shot down near the Dutch island of Texel. The two surviving aircraft met with aircraft of Formation 1 and flew in concert for a distance to approach Möhne Dam, then breaking off from the group for Sorpe Dam. ww2dbaseThe four bombers of Formation 3 took off two hours after Formation 2 launched, as scheduled. ww2dbaseGibson attacked first when Formation 1 reached Möhne Dam, hitting it. Flight Lieutenant Hopgood followed Gibson, but was damaged by anti-aircraft fire, then was destroyed in the blast of his own "Upkeep" bomb. With Gibson circling nearby to draw anti-aircraft fire, Flight Lieutenant Martin made the third attack run, which was successful despite receiving some anti-aircraft fire damage. Squadron Leader Young's bomber and then Flight Lieutenant Maltby attacked next in sequence, with both bombs hitting, finally breaching the dam. 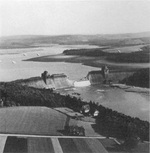 Upon the bursting of Möhne Dam, Gibson led the bombers of Squadron Leader Young, Flight Lieutenant Shannon, Squadron Leader Maudsley, and Pilot Officer Knight toward Eder Dam, while the others returned for Britain. Upon reaching Eder Dam, they found the dam undefended, but the topography made the attack difficult. Shannon attempted the attack first, making six separate runs without gaining enough confidence to release his bomb. Maudsley made an attempt on Eder Dam after Shannon; his bomb struck the top of the dam and detonated, taking Maudsley's bomber down in the blast. Shannon made an attempt again after Maudsley, hitting the dam. Knight was the last to make the attack run, hitting the dam successfully and breaching the Eder Dam. ww2dbaseAmong the bombers of Formation 2, Flight Lieutenant McCarthy's bomber was the only aircraft that reached over the target, Sorpe Dam. His bomb successfully detonated, but it did not breach the earth dam. Three of the Formation 3 bombers were then ordered to attack Sorpe Dam. Pilot Officer Burpee never made it to the target. Flight Sergeant Brown dropped his "Upkeep" bomb in dense fog, hitting the dam, but failed to breach it. Flight Sergeant Anderson reached Sorpe Dam last and found the fog now so thick that he was forced to give up and return to base. ww2dbasePilot Officer Ottley and Flight Sergeant Townsend, both of Formation 3, were sent to attack the smaller dams. Ottley was shot down en route, while Townsend's bouncing bomb detonated at the base of Ennepe Dam but failed to breach it. It was later concluded that Townsend probably attacked Bever Dam by mistake instead of the intended target of Ennepe Dam. ww2dbaseOn the return flight, Young's bomber of Formation 1 was hit by anti-aircraft fire off the Dutch coast crashed into the sea. ww2dbaseIn all, 53 of the 133 air crew members on this mission were killed and three were captured. The survivors were later highly decorated, including Gibson, who received the Victoria Cross, Britain's highest military honor. They were kept together as an elite bomber unit later named the No. 617 Squadron with the nickname "Dambusters". ww2dbaseAt 0730 on 18 May, a Spitfire aircraft of No. 542 Squadron flew across the region and photographed the extent of the damage. The breach of Möhne and Eder Dams flooded the Ruhr region with over 300,000,000 tons of water, flooding mines, farms, houses, factories, and infrastructure. The dam breaches allowed RAF command to claim Operation Chastise as a victory; "I feel a blow has been struck at Germany from which she cannot recover for several years", said Barnes Wallis. Statistics showed that the attacks successfully reduced water production capacity of the region to a quarter of its pre-attack levels, which had immediate consequences for nearby industries. However, the flooding also led to the death of 1,294 people (and another 47 below the Eder), 749 of which were Ukrainian prisoners of war and most of the rest innocent civilians. ww2dbaseWhilst the breaching of the iconic Ruhr dams raised the morale of the British public and helped persuade the United States that the war was going well, it was also a huge affront to German prestige and self-esteem. 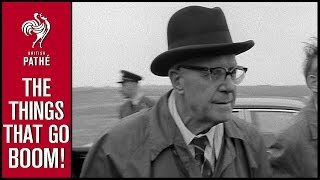 Although Albert Speer, for one, expressed post-war curiosity on the British failure to conduct follow-up attacks to compound the damage to the Ruhr region, the British ability to precisely deliver a weapon of such power troubled the Germans enormously. ww2dbaseThe immediate effects of the tsunami-like flood waters which resulted from the breaching of the Möhne and Eder dams was devastating, several power stations were destroyed or temporarily put out of action, twelve war production factories were completely destroyed and many more damaged (sources vary between 91 and 114), and railways, locomotives and rolling stock were also destroyed or damaged. In addition, the flood waters disrupted river and canal transport, which was vital to the Germans; after the floods subsided, canal banks had to be repaired and long stretches of the rivers and canals had to be dredged of silt. ww2dbaseLarge swathes of arable farmland were washed away and the harvest for that year was completely ruined. In the weeks and months following the attack, steel production in the Ruhr fell significantly (by 20,000 tons in the second quarter of 1943) and coal extraction was also reduced drastically (a drop of 813,278 tons in May alone), almost half of which could be directly attributed to the "Dambuster's Raid". Waterworks, which were important for the regional coalfields, were totally out of action for months, and the loss of farmland, agricultural produces and cattle in the floods also had serious long-term implications - in June 1943 (the month after the raid) meat rations for "normal customers" in Germany were reduced for the second time in two months. ww2dbaseThe problems faced by the Germans as a consequence of the raid were threefold. Firstly there was the cost, time and effort required to repair and rebuild the damaged factories, power stations, bridges, railways and other buildings (which has been estimated at a staggering £5.9 billion in today's money). Secondly,there was a short-term but not critical water shortage in Germany. Water which was essential for the extraction of coal and for steel production as well as for drinking, sanitation and for use by the fire services meant that the dams needed to be repaired before the autumn rains could create a longer-term problem for the following year. The third problem, was that of manpower to repair the damage. This required 7,000 Organization Todt labourers to be drafted away from constructing Hitler's Atlantic wall (which was destined to defend against the anticipated Allied invasion of France), leaving bunkers, gun positions, anti-tank ditches and beach defences incomplete when D-Day occurred on 6 June 1944; thus saving many Allied lives and enabling a successful invasion. ww2dbaseThe "Dambusterss raid" was not just a spectacular propaganda exercise. It did real damage to the German ability to wage war, psychologically, materially, logistically and financially. Fifty three brave young Allied airmen paid the ultimate price but their heroic sacrifice very clearly shortened the war to quite a considerable extent. Despite the dams' significant military value, there were some who questioned whether such attacks were justified, for that the attacks had killed over a thousand lives, many of whom innocent civilians without a direct connection to the German military. ww2dbaseIn 1977, Protocol I to the Geneva Conventions prohibited unjustified attacks against installations such as dams, dykes and nuclear power stations for their potential consequences on the civilian population. 26 Feb 1943 The British government authorized the use of the new water-skipping "Upkeep" bomb against German dams. 21 Mar 1943 No. 617 Squadron RAF was established at RAF Scampton, England, United Kingdom under the command of Wing Commander Guy Gibson for the purpose of launching an attack upon the Ruhr dams in Germany. 28 Mar 1943 Wing Commander Guy Gibson flew a Lancaster bomber down Derwent reservoir near Sheffield in central England, United Kingdom to try out flying very accurately at low level. 29 Mar 1943 Guy Gibson was summoned to Group Headquarters where he was given a more detailed briefing by Ralph Cochrane, including details of the proposed targets of the Möhne and Sorpe Dams in Germany. 8 Apr 1943 The first modified Lancaster ED765/G ("G" for "Guard" denoting the special security arrangements required) bomber was delivered to the Royal Aircraft Establishment at Farnborough, Hampshire, England, United Kingdom for planned attacks against German dams. 10 Apr 1943 The first modified Lancaster bomber was moved to RAF Manston, England, United Kingdom to conduct dropping trials for attacks on German dams. 16 Apr 1943 The first release of a non-explosive "Upkeep" bouncing bomb took place at Reculver, off the North Kent coast in Britain, but the device broke up on hitting the water. 17 Apr 1943 The demanding training of dropping the new "Upkeep" bombs at low altitudes had proven too much for some British pilots. Pilot Officer Bill Divall replaced Sergeant Ray Lovell followed soon after by Flight Sergeant Lanchester and his crew being withdrawn. This brought 617 Squadron's stenghth down to 21 crews. 29 Apr 1943 After much experimentation an "Upkeep" bomb drop was successfully carried out at Reculver in southeastern Britain. By this time several of the new Lancaster bombers modified for dam attacks had been delivered to the squadron's base, RAF Scampton, in Lincolnshire. 8 May 1943 Guy Gibson, together with Harold Martin and John Hopgood, made a number of successful practice drops of "Upkeep" bombs at Reculver off southeastern England, United Kingdom. Low level training, which had now been consolidated at the Uppingham reservoir and a dam on the Colchester reservoir, was reduced from 150 feet to just 60 feet. 13 May 1943 Squadron X of the No. 5 Group of the British Royal Air Force, led by Wing Commander Guy Gibson, received water-skipping "Upkeep" bombs for the upcoming mission against German dams in the Ruhr region. 14 May 1943 In Britain, following more "Upkeep" bomb dropping training at the Wainfleet Bombing Range on the Wash (where a wooden mock up of the dam's towers had been constructed) at full night dress rehearsal was conducted on the Uppingham and Colchester reservoirs. 16 May 1943 Wing Commander Guy Gibson's Dambusters took off from Lincolnshire, England, United Kingdom for an attack on the Ruhr River dams in Germany. 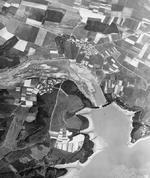 17 May 1943 The Edersee Dam was breached by a British air attack. 17 May 1943 The Möhnesee Dam in western Germany was breached by a British air attack. 18 May 1943 At 0730 hours, a Spitfire aircraft of No. 542 Squadron RAF flew across the Ruhr region in Germany and photographed the extent of the damage from the Dambuster Raid. 27 Jun 1943 Despite the Möhne reservoir dam and the Edersee reservoir dam still damaged from the 17 May 1943 British raid, total water output was restored to full capacity by this date, achieved by the implementation of the emergency pumping scheme inaugurated the previous year. 22 Oct 1943 The dam at the Möhnesee reservoir in western Germany was largely repaired. No.617 Squadron was based at RAF Scampton, a few miles north of Lincoln. Today this base is home to the world famous Red Arrows display team. Whilst the Germans were able to make good the damage in a relatively short space of time it would require some 20,000 workers to be taken off work on the Atlantic Wall to complete the repairs. Barnes Wallace would later be critical of the fact that the RAF did not make further attacks with conventional bombloads to disrupt the repair work. Nonetheless, the raid proved a great morale booster to the hard-pressed British public, and Guy Gibson would receive the Victoria Cross from King George for his role in drawing enemy flak away from other attacking bombers making their approach to the target. Does anyone know where I can find a copy or original/negative of the Dambuster's celebratory dinner - I have the menu just need a photo of the group of men at the dinner to go with it ? Author Manchester's comments regarding the out come???? The Royal Air Force was the only arm that could attack Germany constantly Therefore any attack is worth the effort. THIS WAS THE SECOND TIME THE GERMANS HAD GONE TO A WORLD WAR. WE WERE NOT GOING TO LET THEM DO IT A THIRD TIME!!!!!!! I have been told that Charles Mears was part of one of the crews who flew on the Dam Busters raid. I would be grateful if you could clarify this. So, 40% fatalities among the attackers. Most of the casualties on the ground were Allied PoWs, the rest innocent German civilians. And Germany repaired the damage within 41 days. This attack would now be considered a war crime. Not so big and clever now, are you? (Just watched the ridiculous film). First Wave 1. Wing Commander G.P. Gibson flying ED932/G "AJ-G" 2. Flight Lieutenant J.V. Hopgood flying ED935/G "AJ-M" 3. Flight Lieutenant H.B Martin flying ED909/G "AJ-P" 4. Squadron Leader H.M.Young flying ED887/G "AJ-A" 5. Flight Lieutenant D.J.H. Maltby flying ED906/G "AJ-J" 6. Flight Lieutenant D.J. Shannon flying ED929/G "AJ-L" 7. Squadron Leader H.R. Maudslay flying ED937/G "AJ-Z" 8. Flight Lieutenant W. Astell flying ED864/G "AJ-B" 9. Pilot Officer L.G. Knight flying ED912/G "AJ-N" Second Wave 1. Flight Lieutenant J.C. McCarthy flying ED925/G "AJ-Q" 2. Flight Lieutenant R.N.G. Barlow flying ED927/G "AJ-E" 3. Flight Lieutenant J,L, Munro flying ED921/G "AJ-W" 4. Pilot Officer V.W Byers flying ED934/G "AJ-K" 5. Pilot Officer G. Rice flying ED936/G "AJ-H" Third Wave 1. Pilot Officer W.H.T.Ottley flying ED910/G "AJ-C" 2. Pilot Officer L.J. Burpee flying ED865/G "AJ-S" 3. Flight Sergeant K.W. Brown flying ED918/G "AJ-F" 4. Flight Sergeant W.C. Townsend flying ED886/G "AJ-O" 5. Flight Sergeant C.T. Anderson flying ED924/G "AJ-Y"
It was a war crime as well as the bombing of the young, old and sick civilians fleeing from the Eastern Front. I was a child then and I witnessed it - never to be forgotten. The suggestion that F/Sgt. Lanchester was sent back to his previous squadron because he was not a good enough pilot is a slur on the memory of an airman who, along with the rest of his crew, performed superbly after leaving 617 Squadron. This crew left of their own accord because they could not accept the judgement that their navigator was not up to scratch. This decision is believed to have been made by Dinghy Young or Gibson himself. The navigator, F/O Cleveland, was killed during his second tour of duty. I believe the others survived the war. The Dambusters raid was a war crime, as well as a complete failure and a waste of resources as Sir Arthur Harris admitted at the time.